PRESS RELEASE: If you've been using EZdrummer for some time now and yearn for greater control over your drum tracks, now's the time to check out the multi-award winning Superior Drummer 2.0. And right now there's 50% off the crossgrade price! Superior Drummer 2.0 gives you the power to tweak and customize your tracks in greater detail with an advanced mixer functionality that includes total bleed control, bussing capabilities and built in FX such as 5 band EQ, highpass and lowpass filter, gate, compressor and transient. What's more, version 2.2 delivers an integrated groove player plus 'Midi Nodes' - a feature that allows you to stack instruments on top of each other and customise your mapping - all within an easy-to-use interface. And it doesn't stop there. 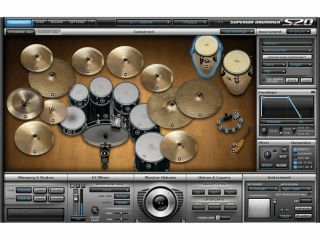 Superior Drummer 2.0 users can benefit from the endless possibilities presented by a terrific choice of EZX and SDX expansion packs, not to mention great value downloadable midi packs and the new S2.0 Producer Presets series. Snare yourself a great deal and crossgrade to Superior Drummer 2.0 for just £64.50 / €79.50 until 30th April 2010! For more information on the offer, see the Superior Drummer website. S2.0 Producer Presets is a new product line from Toontrack for its award-winning drum sampler Superior Drummer 2.0. For the first release, Toontrack has collaborated with allenmorganaudio to create a versatile presets package designed by acclaimed producer/mixer/re-mixer himself, Allen Morgan. Allen Morgan has worked with a diverse range of artists spanning from country giants such as Taylor Swift and Dolly Parton to pop acts like NSYNC and rock acts such as Nine Inch Nails. Allen is known for his innovative mixing and his ability to create unique, expansive soundscapes and being able to lend a contemporary touch to all his work without ever losing track of the organic feel. The pack comes with five different presets and works with the core Sound Library in Superior Drummer 2.0.